Mackerel Sky is the creation of owners Tom and Linda Dufelmeier through the initial and continuing support and encouragement of family, friends, and a long roster of talented employees across the years. We offer useful, functional products that are beautiful, well designed, well made and longlasting to make best use of the earth's limited resources, while enriching one's everyday activities, bringing art to articles of everyday life. More now than ever before we choose to showcase the hand made to help maintain its availability and to assure that a livelihood is possible for artisans in the United States and Canada, though we do carry a small percentage of products from artisans around the world. It is important to our culture, as well as our economy. Each of the small choices we make (Eat good food. Be kind. Tell the truth.) indeed makes an impact. Fine craft is intended to be timeless. The choice of quality materials and quality time in the making intends the product be long lasting and of heirloom quality. Reuse, as in continued use, is beyond recycling. We invite you to visit. The choice of beautiful custom cherry wood display units to showcase fine craft help to achieve a warm and welcoming atmosphere. While we do have a number of standard products on hand, we attempt to keep things fresh and interesting. 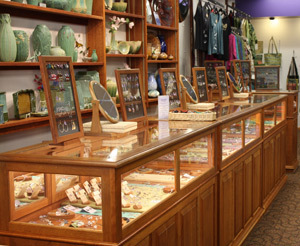 Our rotating gallery exhibits and trunk shows help achieve that as well. SERVICES: Mackerel Sky offers personal attention in a relaxing atmosphere when you visit the Gallery. Shopping by phone or e-mail is available as well. 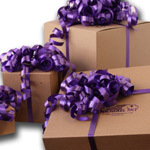 GIFT WRAPPING: We package your gift in our signature box with the purple logo and "Fabulous Purple Bow". UPS SHIPPING: Mackerel Sky can ship your purchases anywhere in the continental U.S. via UPS. WISH BOOK REGISTRY: a listing of what you wish for when you wander the Gallery for your friends and family to access for gift-giving occasions. WEDDING REGISTRY: a registry for the wedding couple to indicate what they desire. Call or e-mail, and we can tell you their selections, or fax or e-mail you a list. The Staff is skilled at helping choose wedding gifts for couples not actually registered at the Gallery with some information about the couple's style and color preferences. GIFT CERTIFICATES: a special certificate made out for any dollar amount and wrapped in a signature Mackerel Sky box with the "Fabulous Purple Bow". This is a wonderful gift for any occasion. LAYAWAY: We offer the opportunity of an interest-free layaway of two months. A 25% deposit is required. An additional 25% payment is due in 30 days. The 50% balance must be paid at the end of 60 days. SPECIAL ORDERS: We are happy to attempt to order items which we do not have in stock. Availability of some items depends on the artist's production schedule. RETURN POLICY: Mackerel Sky will be happy to accept merchandise for return within 45 days of purchase either for exchange or store credit. For items returned with a receipt, a cash refund can be issued for cash purchases and a charge card credit for charge card purchases. All items purchased on sale are not returnable.